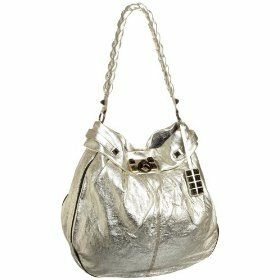 Add some rocker chic to your wardrobe with the Rock-A-By Betsey Bucket Bag. In addition to having an abundance of the letter "b" in its name, this slouchy purse has some serious attitude that will ramp up any outfit. Fitting right in with current trends, the Rock-A-By has a smattering of studded details that don't overwhelm the design of the handbag but merely add a little personality. Not every color option has quite the edgy punch of this gold leather and black studs version of the bucket bag with its slightly crinkled texture and glossy sheen. If you like the shape and overall style but prefer something tamer, look for the Rock-A-By in its other color combos. The crisp white leather option with turquoise studs almost has a soft, beachy feel to it. The other two versions are black leather with pink detail or dark gray with yellow. In my opinion, though, the gold seems to fit best with the style of the bag. Betsey Johnson gave the Rock-A-By Betsey some extra pizazz with a sturdy braided strap, which also has a comfortable shoulder drop. As you'd expect with an oversized bucket bag, the interior is deep and roomy for ample storing space. Overall, the handbag is somewhat affordable at just under $300, and it's a subtle way to get in on the studded style without going whole hog.